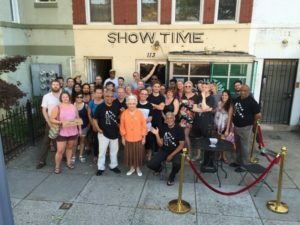 The crowds of young D.C. music fans show up on Sunday nights at Show Time, a dive bar that features perhaps the most unusual show in town. Granny and the Boys include three middle aged African American funk musicians, and “Granny,” 84-year-old Alice Donahue, a white, classically-trained keyboardist who never played in public before this gig that has lasted almost 20 years. Bassist David Lynch, two decades Donahue’s junior, met her when she was taking college courses soon after her husband died. Despite their age difference, they became a couple. And, in time, she was convinced to fill in for a missing band member. The rest is (unlikely) history. In the photo, the three band members wear black t-shirts. Granny stands front and center.